There is only one reason the recently postponed occupation for universal suffrage has been discussed, deliberated and disputed to such exasperating degrees – the authorities are terrified. 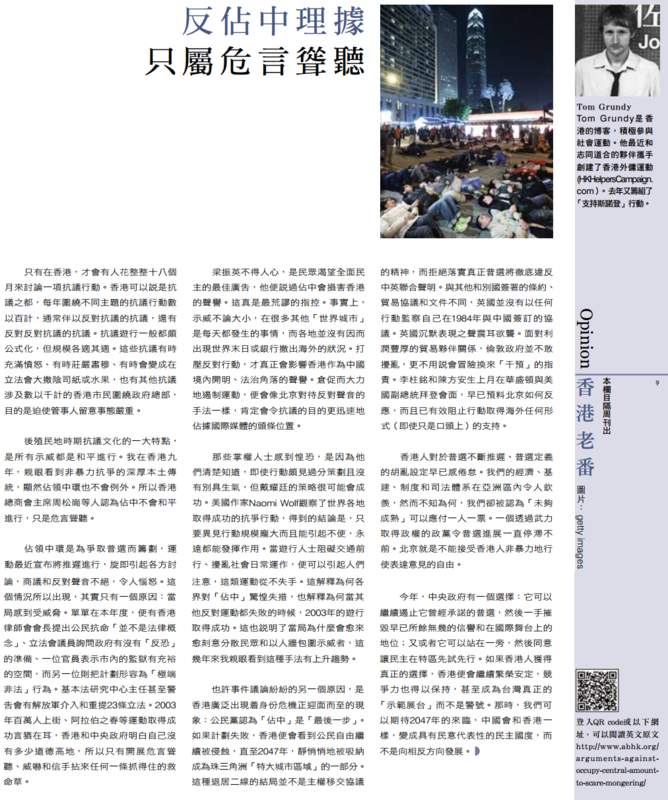 This year alone, the Law Society president stated, somehow, that civil disobedience was “not a legal principle”, a lawmaker asked the government about ‘terrorism’ readiness, one official boasted of ample space in the city’s prisons as another described the plan as “extreme and illegal”. The Basic Law Institute chief even warned of possible PLA involvement and the resurrection of Article 23. With 2003’s successful mass rally and movements like the Arab Spring in mind, the local and national governments know that they’ve little moral high ground, leaving them to scaremonger, threaten and grasp at straws. CY Leung, whose unpopularity remains full democracy’s greatest advertisement, says the protest will damage the city’s reputation. This is the most absurd charge, as demonstrations – big and small – occur daily in lots of other ‘world cities’ without the apocalypse unfolding or banks fleeing overseas. Cracking down on such a protest, however, would damage Hong Kong’s reputation as a corner of openness within China supposedly governed by the rule of law. A hasty, heavy-handed suppression of the movement, akin to how Beijing deals with uprisings, would certainly see the cause skyrocket in international headlines. Instances of media framing in Hong Kong’s English press over the past fortnight alone. Those is power are scared because they know full well that, despite its rather inorganic over-planning, Benny Tai’s strategy might just work. By examining successful struggles around the world, American author Naomi Wolf concluded that dissent, when it is en-masse and causes inconvenience, always works. Whenever a march stops traffic and disrupts business-as-usual, people take notice and it never fails. This explains the flustered reaction to ‘Occupy’ and explains why the 2003 protests worked when others failed. It also shows why authorities work so hard to divide and ‘kettle’ protesters – a trend I have watched increase over my years here. 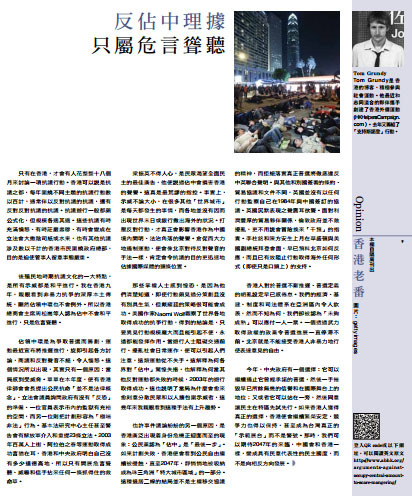 Perhaps another reason this particular issue is so contentious is the feeling that Hong Kong’s wider identity crisis is coming to a head – the Civic Party deemed ‘Occupy’ the ‘last resort’. If this plan fails, the city could see its civil liberties continue to erode until it is quietly absorbed into the Pearl River Delta ‘mega region’ come 2047. Such a decline would not be in the spirit of the handover agreement and – moreover – a refusal to enact true universal suffrage would outright violate the Sino-British Joint Declaration. Unlike with other treaties, trade deals and documents signed with other nations, Britain is doing nothing to police its 1984 agreement with China. The silence is deafening. London daren’t upset its lucrative relationship with its trading partner, lest it be accused of ‘interfering’. This was Beijing’s predictable reaction to Martin Lee and Anson Chan’s talks with Joe Biden in Washington last month and it effectively stops the movement from seeking even verbal declarations of support from abroad. 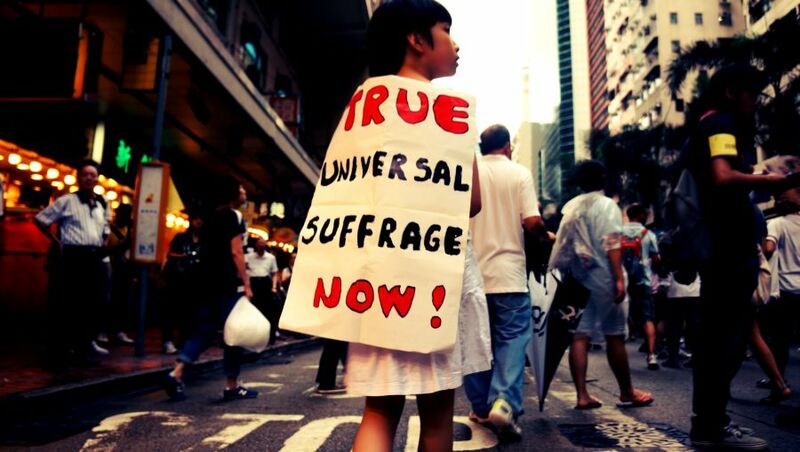 Hong Kongers have been worn down by the persistent deferment and wild reinterpretations of the very definition of universal suffrage. Our economy, infrastructure, institutions and judiciary are the envy of much of Asia, yet somehow we are deemed too ‘immature’ to cope with one-person-one-vote. This constant stalling comes from a party that that took power by force. Beijing simply cannot accept the idea of non-violent Hong Kongers exercising their freedom of expression. This year the national government has a choice: it can squander any remaining good-will and its standing on the world stage by suppressing the meaningful universal suffrage it once promised or it can stand aside and agree to let the SAR be a testing ground for democracy. If Hong Kongers are given a genuine choice, the territory will remain prosperous, competitive and may even become a true ‘showcase’ for Taiwan, instead of a warning. Then, it is hoped when 2047 comes along, China will resemble a representative and democratic Hong Kong more than the other way around.